This plastic serving pitcher holds 2.2 liters of liquid. It's compact size fits easily into refrigerators. Perfect for lemonade or other mixed drinks. Lid twists for easy pour and secure closure. Comes in assorted colors including: green, blue, orange, pink and clear. 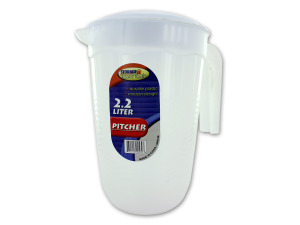 Pitchers are packaged loosed with sticker label. Each one measures 5 1/2" in diameter and are 7 1/2" tall.